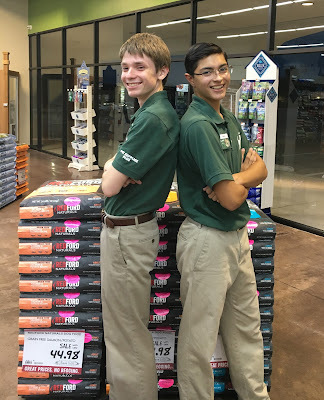 Pawsitive Impressions: Carrollton, Texas Team Members Rock the Redford and the Positivity! Carrollton, Texas Team Members Rock the Redford and the Positivity! Max and Michael did everything right, and the neighbor, Joseph, was so happy he gave the Carrollton, Texas store a five star review on Yelp! This just goes to show you, Redford Naturals, neighbor engagement and grab 'n' go carry outs are the secret sauce! I went in and was greeted with a warm welcome from the young man at the register. I was then shown where my dog food, Iams, was in the store. I told the other young man, Max, that I was having problems with the Iams. He then showed me Redford and I was very impressed by his knowledge of the food. He carried the bag of Redford to the counter for me and Michael, who was at the register, was very polite and a great conversationalist. He rung me up with enthusiasm and asked Max to stay at the register while he carried it out to my car for me. Overall they seemed to have fun with their job in a positive work environment. Great teamwork! I'm definitely coming back for more Redford and positivity.